Three local authors will be at Book Warehouse for Suburbia Takes on Main Street to talk about their individual novels that all feature suburbs of Vancouver. 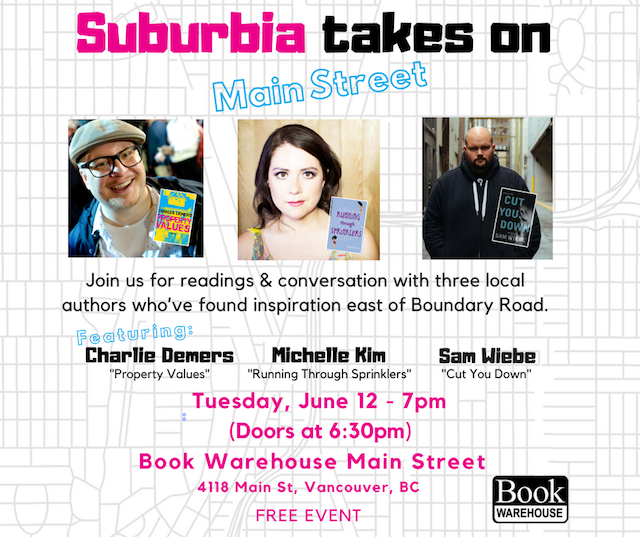 Miss604’s own Michelle Kim will be reading from her book Running Through Sprinklers (set in Surrey); Charlie Demers will read from Property Values (set in Coquitlam); and Sam Wiebe will read from Cut You Down (set in Burnaby). About the book: “Two life-long best friends grow up and begin to grow apart in this honest, deeply felt middle grade debut. It’s only ever been the two of them. Two halves of the same person. Best friends forever—until they aren’t. Everything has changed this year. Nadine has suddenly skipped a grade and gone to high school without Sara. No matter how hard she fights to save their friendship, Sara can feel it slipping away. But change can happen from the inside, too. About the book: “As a shaky truce between suburban gangsters starts to unravel, schlubby civilian Scott Clark has other things on his mind: if he can’t afford to buy out his former father-in-law, Scott’s about to lose the only house he’s ever called home. In Vancouver’s red-hot real estate market, he doesn’t have a chance–until he and his best friends take the last-ditch measure of staging a drive-by shooting on the property to push down the asking price. But when Scott’s pretend gangland stunt attracts the attention of real criminals, his make-believe crew soon finds itself in the middle of a deadly rivalry. Check out these three local authors and find out why they chose to write about life east of Boundary Road on June 12th.